HMH Books for Young Readers, 9780544307100, 368pp. There was a time when geeky, squeaky-clean Max Kilgore would never lie or steal or even think about murder. Then he accidentally unearths a devil, and Max’s choices are no longer his own. The big red guy has a penchant for couch surfing and junk food—and you should never underestimate evil on a sugar high. With the help of Lore, a former goth girl who knows a thing or two about the dark side, Max is races against the clock to get rid of the houseguest from hell before time, and all the Flamin’ Hot Cheetos this side of the fiery abyss, run out. 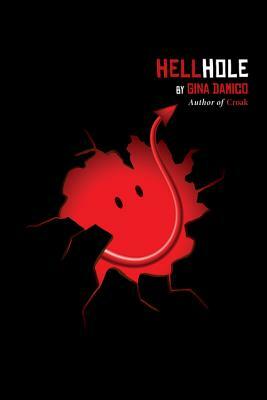 Gina Damico, author of the Croak series, once again delivers all the horror, hilarity, and high-stakes drama that any kid in high school or hell could ever handle. * "Hilarious—all the way through." "Damico draws readers into this quirky novel with well-written prose, believable characters, and an evenly plotted story line." "Damico's blend of bleak humor and harsh reality lends itself well to Max's social awkwardness and Lore's biting cynicism, while Burg is outrageously appalling." "The snarky Burg, Max's tendency to catch things one step too late but with wry humor, and the absurd piling on of events all work to make a quite amusing, if very dark, novel."